Wow, I love this concept and it’s very well done. Any reason why the top’s sliding off in the wrong direction? Gravity should be pulling it downward. No, yor’re not still drunk! Slick design, but wouldn’t the top part of the bottle slide down to the right? It would after it has been cut. First when it gets sliced it does go upwards very shortly, then it comes down. What I am concerned is the actual bottle top and cap. I was wondering about the balance of the top, since 2 parts are split, the very top should be in the middle of both seperate pieces or else the top would weigh more right? ( it would tilt easily. Just my observation. Either way amazing idea and concept. i agree on the wrong sliding direction, but this is probably the best packaging i’ve ever seen. 5 thumbs up. if you’re into anime, here’s a typical scene: a swordsman slices some pillar right through – on an upwards stroke. so, the pillar would be split like that due to the upwards force of the blade. only a moment later would the top half begin to slide down. Classy and creative. I especially like the embossed pattern and the slice logo cleverly woven into the bottle and package design. Very nice touches. This design is AMAZING! I do not drink alcohol, but I would buy one bottle just for owning such a beautiful design. 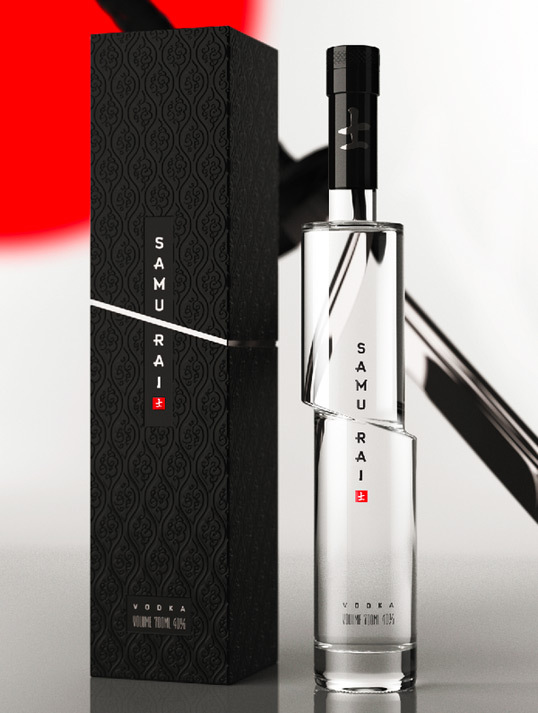 Why does he not sell the design to 7 Samurai Vodka. They seem like a prime candidate. Oh and if it does every hit the market, let me know and I will definitely buy it. so yeah, awesome but wrong. if he had done it “correctly” – would it have had the same effect? when you see this bottle, the first thing you think is that a sword was taken to it in an upward right-to-left motion. if the top half of the bottle were sliding down, or tilting, or anything else…. would you get it as quickly? poets and lyricists get “poetic license” to change words to make things rhyme and fit better….. can’t artist’s be granted “artistic license” to make things more aesthetically pleasing? The reason why the bottle goes up is because the sword sliced the bottle with such impact that before it goes down it goes up. i could picture it already… get it.. the sword slice it up not down that’s why it goes up. looks great though. I agree with people who say that it will slide up for the moment then down again but the fact is that a lot of people won’t recognize that fact and having to explain it to people over and over again will be annoying. Why not just make it simple and change the direction of the cut. this definitely needs to get out. i saw this image and went to their website looking if i can buy this until i saw that it wasn’t out. i would love to have this. doesn’t matter what would actually happen to the bottle. this gets the point across, and it’s aesthetically beautiful. It’s art imitating life imitating art. if the top of the bottle was sliding down, i submit that it would look improper and i wouldn’t like the design of the bottle very much. Absolutely beautiful! Gogo production.. I want a bottle! AMAZING!!! I REALLY WANT THIS BOTTLE!!! DEFENITLY THAT BOTTLE OF THE SAMURAI! AWESOME DESIGN! GOOD JOB MR. SCHREIBER!!! PLEEEEEAAASSEEE get this bottle produced. I collect unique vodka bottles and this one is stunning!! How about stop getting all technical about which way the thing is sliding and just enjoy the design as is. First of all—killer design (pun intended). Second of all—the position of the top slice doesn’t matter. You see the word “Samurai” and you instantly get the concept. Third of all—the top half is positioned higher because if it was lower, the bottle would be unbalanced. Plus, the bottle would look lopsided. And lastly—if you’re complaining about the top slice in the first place, you don’t know anything about design. Finally. It really shouldn’t be that hard to understand. This design is just lovely. I really hope that Arthur gets some interest from a company. where can i buy the bottle pls help ? This is an excellent example of what is called tameshigiri &, yes, the cut would be made from the lower right to upper left. I’ve trained in this martial art for more than 25 years, & would be among the first to buy several bottles for me & for my Sensei (teacher). Please advise if this comes to market. Put a little extra glass inside the bottom to offset the top and make it stable.